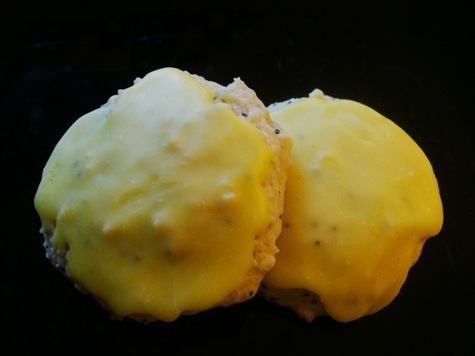 A soft, lemony, slightly gooey cookie. 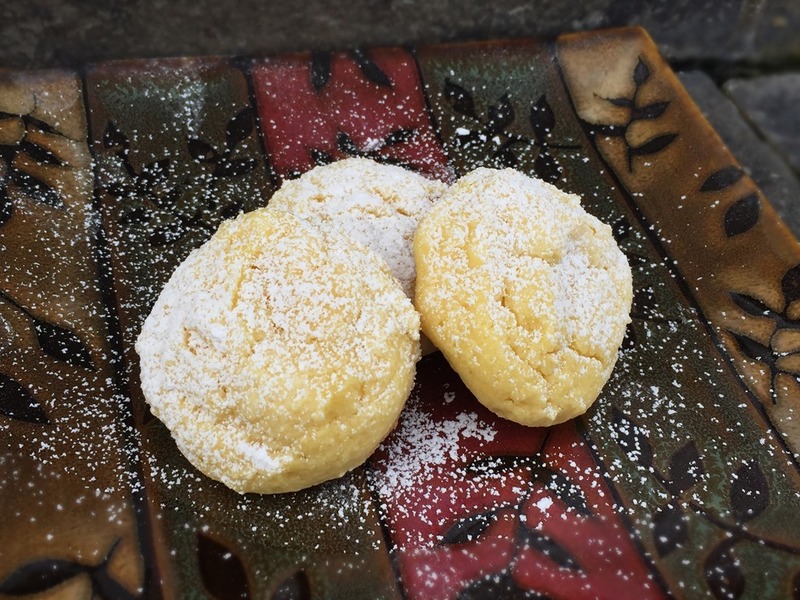 We make a similar cookie with a white cake mix that we call Snowball Cookies, but there was just something wrong with calling these “Yellow Snow”- ball Cookies. This is a great recipe for kids and beginning bakers, as there is minimal measuring. Kids are also great helpers when it comes to rolling things in powdered sugar. Just plan a little extra clean-up time if you let them help with that step. In a large mixing bowl, combine butter, cream cheese and vanilla. Use an electric mixer to beat until light and fluffy. Beat in egg and lemon zest and then cake mix. Chill dough in the refrigerator for at least 1 hour. Place about ½ cup powdered sugar in a small bowl. Roll dough into balls (about 1” in diameter) and then roll in powdered sugar. Place on baking sheets. Bake for 10-12 minutes. Cool on baking sheets for 2 minutes, and then remove to a wire rack to cool completely. Dust cooled cookies with additional sifted powdered sugar. Soft and fluffy, like a good pillow. Just lemony. And edible. A nice break from a season full of chocolate-dipped and candy-topped confections. Think of them as a much needed palate cleanser. Recipe adapted from Yes to Yum. In a medium bowl, combine flour, baking powder and salt. Set aside. In a mixing bowl, beat butter and sugar until light and fluffy. Beat in eggs, sour cream, milk, lemon juice, vanilla and lemon zest. Gradually add flour mixture. Place ½ cup sugar in a small bowl. 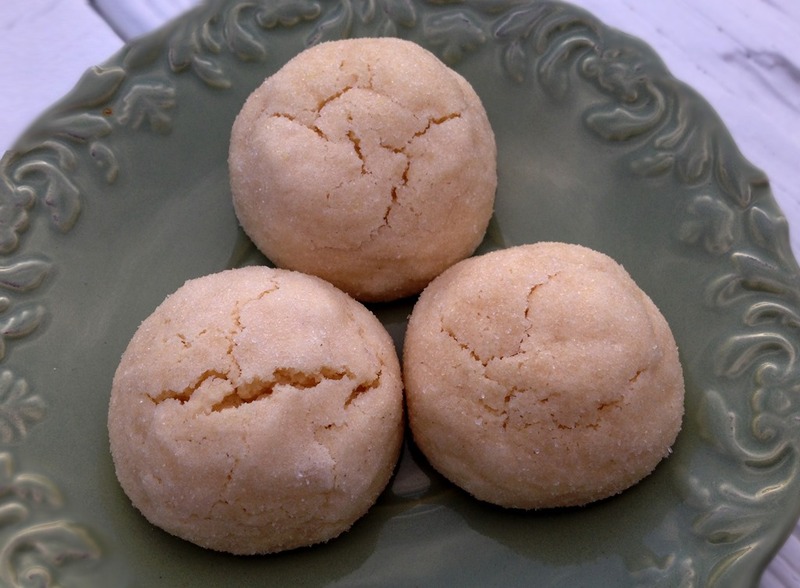 Roll cookie dough into 1” balls (or slightly smaller) and roll in sugar. Place on prepared baking sheets. Bake for 11-­12 minutes, or until the tops are set. These cookies will stay a pale color, even when they are baked through. Desserts in our house usually have to come in both a chocolate and non-chocolate variety. So, alongside our Double Chocolate Waffles, we had these Lemon Yogurt Waffles. These waffles are a little sweeter than regular waffles (even after I cut the sugar in half from the original recipe), so I don’t think I would want them for breakfast. Little A had no problem eating them anytime of the day, however. The waffles are made with plain yogurt and flavored with fresh lemon zest. They have more of a light cake consistency than regular waffles. 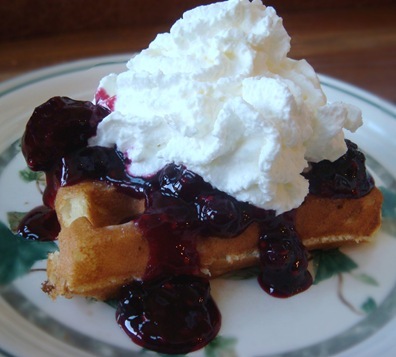 The berry sauce was a perfect accompaniment for the sweet lemon taste of the waffles. Sift together the flour, baking powder, and salt into a medium bowl. In another bowl, whisk together the yogurt, sugar, oil, eggs, lemon zest, and vanilla. Slowly whisk the dry ingredients into the wet ingredients. For Brian’s birthday a couple of weeks ago we had this wonderful cheesecake. 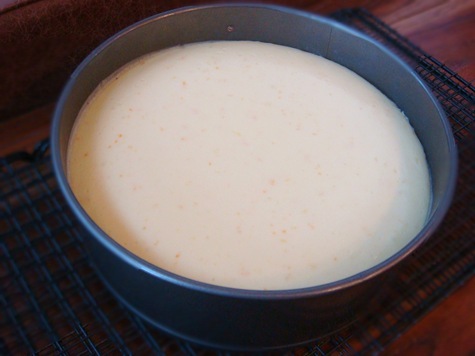 It is a very creamy cheesecake flavored with lemon and orange zest and juice. You can use blood oranges or regular naval oranges. Lime would also be a great flavor, instead of the lemon. 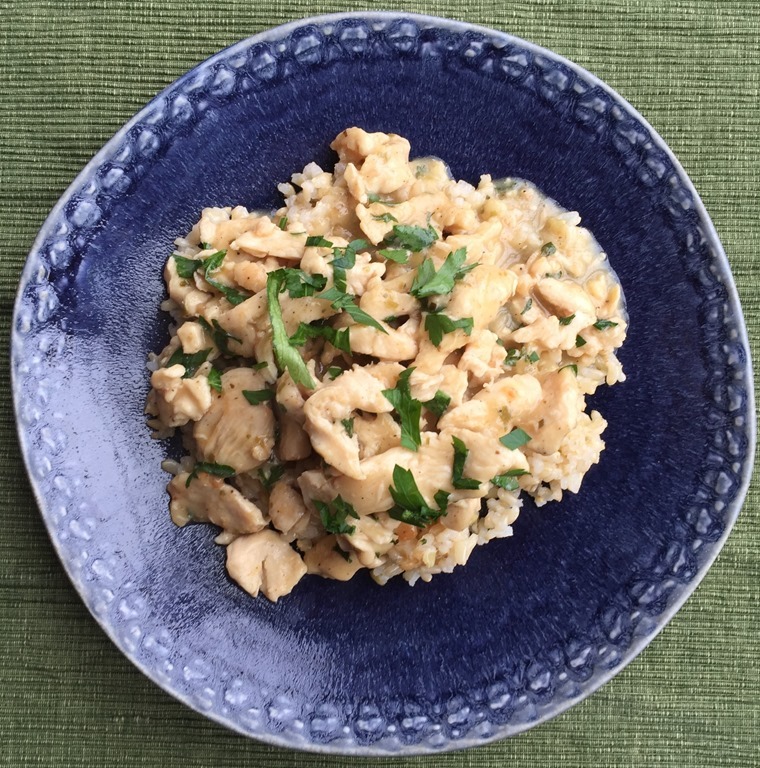 The recipe comes from Aimée Bourque, who is the editor of Simple Bites and author of the blog Under the High Chair. The original recipe did not have you bake the cheesecake in a water bath, but I did because I think it helps the cheesecake cook more uniformly, and reduces cracks on the top of the cheesecake. To prepare your pan for a waterbath, wrap the springform pan in a double layer of foil. Or: this time I did one layer of foil and then put the pan in an oven-safe bag (the kind used for roasting turkeys). Place wrapped pan in a larger roasting pan and add hot, almost boiling, water to the roasting pan to a level about halfway up the outside of the springform pan. If you are nervous about moving a pan full of boiling water: pull the oven rack out slightly from the hot oven. Place roasting pan on the oven rack, place springform pan in the roasting pan, and then add boiling water to the roasting pan. Carefully push oven rack back into the oven. Just out of the oven-No Cracks! 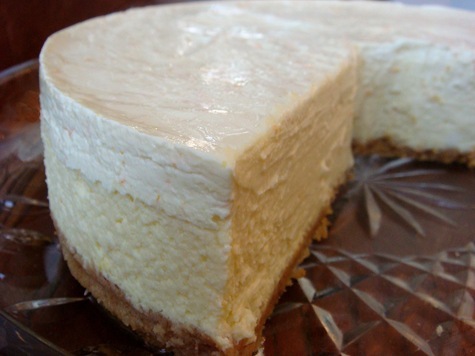 A citrus zest-spiked sour cream makes a perfect topping and hides any imperfections that develop in the top of the cheesecake as the cheesecake cools. 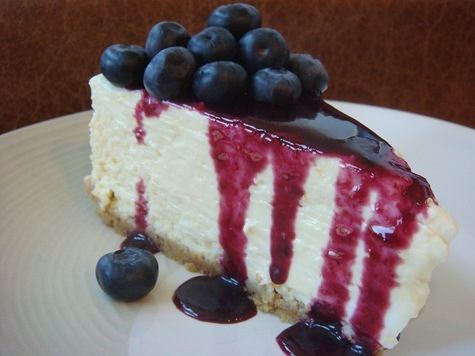 I served this cheesecake with fresh blueberries and this fabulous homemade Blueberry Syrup. 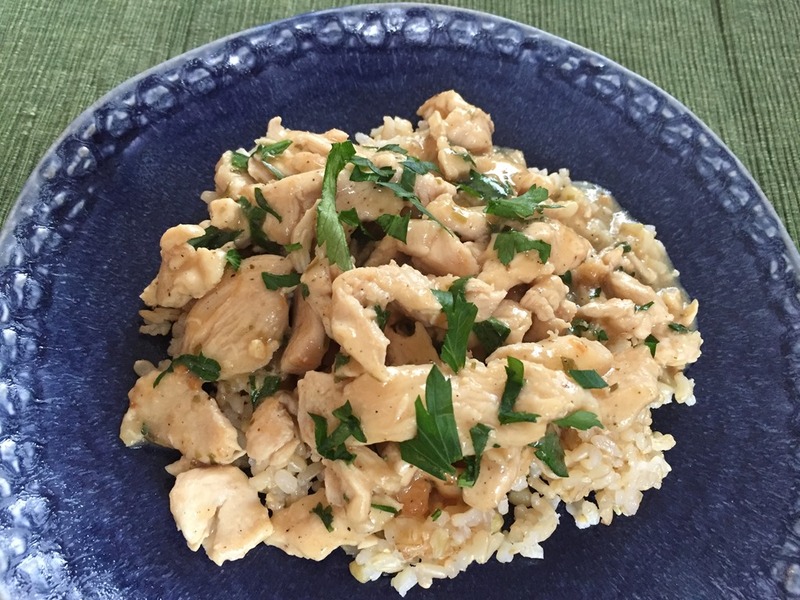 It is flavorful enough that it could also be served on its own without any topping. Place oven rack on the lowest level of the oven. Preheat oven to 350°F. In a small bowl, combine graham cracker crumbs and sugar. Add melted butter and mix. Press onto the bottom of a nine-inch springform pan. Bake crust for 8-10 minutes until slightly golden. Cool. Wrap springform pan in a double layer of foil, or one layer of foil and then place in an oven bag (like the kind used for turkeys). Place springform pan in a larger roasting pan. With a mixer, beat together cream cheese and sugar until smooth. Add sour cream, citrus zest and juice. Mix well. Add eggs, one at a time, mixing until just incorporated. Pour filling over crumb crust. Fill roasting pan (not springform pan!) with very hot (almost boiling) water to about 2-inches deep. Bake cheesecake in the water bath for about 60 minutes. The cheesecake will have puffed significantly, and the middle will still be slightly jiggly. Remove pan from water bath and run a sharp knife around the sides, but do not remove ring. Cool for 15 minutes on a wire rack on the counter. Combine sour cream, orange zest and juice, and sugar together in a small bowl. 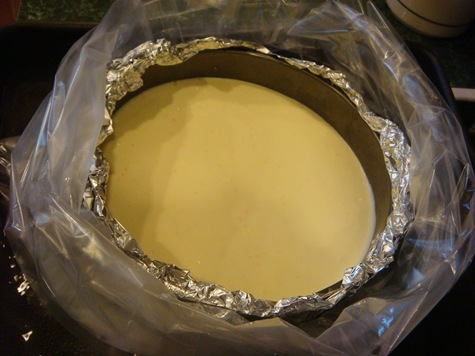 Pour over slightly cooled cheesecake and let stand for half an hour at room temperature. Remove plastic wrap and lift off the outer edge of the spring form pan. If desired, slide a sharp knife under the crust and slide the cheesecake off the spring form base and onto a cake stand or serving platter. 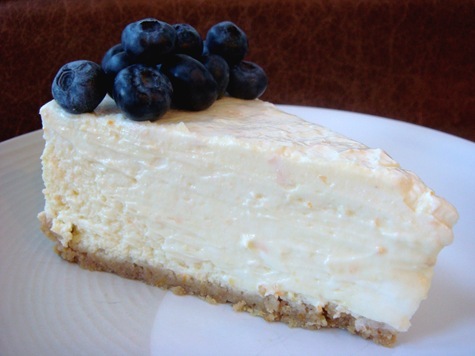 Serve cheesecake alone, or topped with fresh berries or homemade blueberry syrup. Surprisingly, cauliflower is one vegetable that everyone in our house loves doesn’t complain about when it shows up on the table. We especially enjoy this roasted cauliflower, flavored with garlic and a little lemon and garnished with toasted pine nuts and chopped fresh parsley. Preheat oven to 350°F. Line a baking sheet with foil. Spread pine nuts in a single layer on the baking sheet. Bake at 350°F for 3-5 minutes, or until toasted (watch carefully-pine nuts burn quickly). Remove pine nuts from baking sheet and set aside. Increase oven temperature to 475°F. In a Ziploc bag or bowl, combine cauliflower florets, garlic slices, olive oil and butter. Toss until well coated. Spread cauliflower onto baking sheet. Season with salt and pepper. Roast at 475°F for 20 minutes, or until tender. 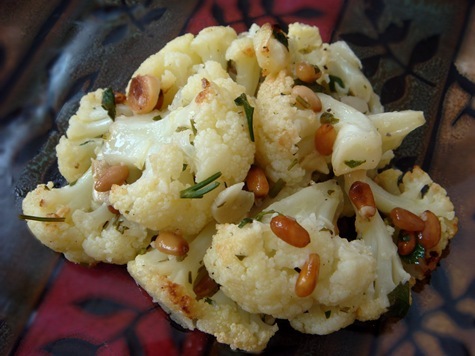 Toss cooked cauliflower with parsley, lemon juice and reserved pine nuts. Taste and add additional salt, if desired. In a medium bowl, combine the flour, baking powder, salt, baking soda and poppy seeds. Set aside. In a large bowl, cream the butter and sugars together until light and fluffy, about 3 minutes. Add the egg, vanilla and half of the lemon zest (save remaining zest for the glaze) and mix well. Add half of the dry ingredients; mix in buttermilk. Add remaining dry ingredients; mix well. Drop the dough by tablespoonfuls onto a greased or lined baking sheet. Bake for 10-12 minutes, until the edges are set. The cookies should be puffy and fairly light in color when they are finished baking. Remove from the oven and let cool for 1-2 minutes on the baking sheet. Move the cookies to a wire rack to cool completely. Mix glaze ingredients. Add more lemon juice, if needed, for a thick drizzling consistency. Drizzle/spread over cooled cookies (or dip the tops of each cookie in the glaze).